but i alas i cannot go, for i have to play truant. i may pay for my 'skipping class' ways, but i am beside myself with needing to get a thrifty fix, i have 'the shakes' and 'the sweats' and it isn't pretty. i find it extraordinary that my puppy trainer chooses to run her class on the very same evening, at the very same time, as was my regular 'thrifting time'. for five weeks i have driven past the thrift store and headed straight to class like a good girl. removed little olive from the car and taken her into the 'lions den' full of big, big puppies that all wish little olive to be 'theirs'. i was all set to go tonight, i felt strongwilled enough to put my thrifting evening once again to the sidelines and then it happened. quite right you are dear readers, a very wicked thing to say, especially as my mother is a lovely caring soul who goes about her busy day in old blighty, traipsing the charity stores and vintage stalls on my behalf. apart from the lovely linens and lace she finds, she also sends me magazines from across the pond so i may enjoy a read with my cup of tea. "just think Tif, could be something just peachy perfect waiting for you tonight" in my little ear... oh yes, the thrifty devil is back on my shoulder making me say such wicked words about my mother. 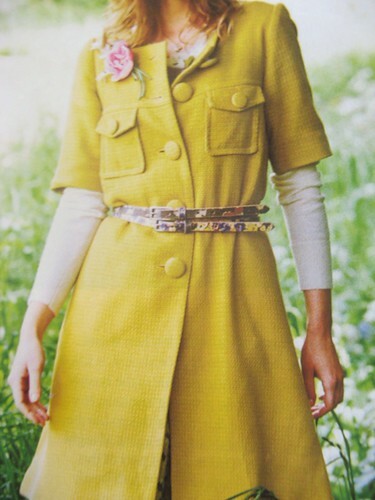 the september issue of country living. i love reading this magazine, i feel it gives me hope that one day, in years to come i may just have digested a piece of valuable 'country living' advice and put it into practise. thus far in my life, i tend to just gaze at the pictures of lovely back yards, prized veggie patches and fabulous cooking advice, daydreaming and a wishing. and that is where i fell by the wayside. and then i started to 'twitch'. the 'thrifty devil' had appeared upon my shoulder. "so what you going to do Tif, you can't buy new... but just think, a cardie of similar 'lust appeal' could be waiting for you on the thrifty racks as we stand here"
"you light weight, call yourself a 'handcrafted thrifty' mama, since when did you ever let family life get in the way of a 'thrifty kill'... you're going soft in your old age" and he continued to taunt me, even at bedtime as he made himself comfy upon my pillow. as i fell into a slumber i recall myself making a 'pact with the thrifty devil' and his charming ways. and so here i am this morning, already thinking of a 'fibbing excuse' for missing class and another 'fibbing excuse' to the kids as to why we can't go. "well your mama needs to go thrifting for a cardigan"? I started the same day as you, (also my mother's birthday). So far, so good. Maybe next year a challenge about limiting thrift shopping also, my stockpile is getting large (despite my retail shop and etsy shop) and my man is geting angry. tell em you're having a birthday week off! Hi Tif, I loved that article, but will never look like that (short, round and cute, not tall, slim and interesting) so none of the clothes would have suited me. Saved by a fluke a nature! However, I have been seriously influenced by the autumn displays in the garden article, and have spent chunks of today running round house and garden clutching branches of berries. That magazine is answerable for a lot of crazes. I'm just about to post my 'take up' of your challenge. Can't wait to hear the outcome:) I hear ya, I cannot wait to see this weeks estate sale listings. Feeling the thrifting urge too. Good luck! I am so delighted as it is perfect for this time of year. Sending you good cardi vibes. Ooh, wish I could get my hands on those magazines...on second thought it's probably for the best that I can't. As for the challenge, I had no sooner posted my acceptance and was off to pick up the wee lass from school when...I spied a heap on the side of the road. I had barely a minute to pull aside and scan the pile. I threw some things in the back of 'Old Bessie' and sped off. I have yet to give it close inspection but, I suspect some serious potential in my loot. Including some vintage kitchen gadgets which I have rather a soft spot for. So, handcrafted, second hand and now to include - 'things found at the side of the road'! I love your challenge!! Because of you I am spending the next few days making gifts instead of buying them. I don't mind at all, but as one of them is for my ten year old's friend, I had to convince her first. So a lovely denim bag it will be. Thank you so much for your inspiration. I have been wondering though, will you allow yourself to buy new fabrics? Country Living, British edition, never disappoint! Well, it's not always totally perfect, but almost always it is. I totally get the thrifting tickle. Like I just know I will find something fantastic. I even get it for specific stores...Happened today. Found two great baskets for the studio for 75 cents each. and sarah, i forgot to answer your question about the fabrics... which is a very good one i might add. oh dear, you are a very bad influence. i may just have to pick up that magazine for all the prettiness. that is, if i can find it ;)! 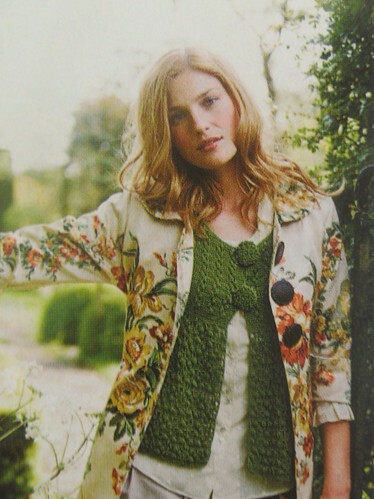 I didn't get as far as p.97 yet -I got stuck at p.23 and had to make myself a felted bag like the one the model had! Good luck with your challenge! have fun thrifting, good look finding what you're dreaming of. as a fellow country living subscriber living in italy i fully understand how you feel! at least you have thrift shops there, not in italy. i have to dream of my next trip back to the uk each time my copy of the magazine arrives. I found your blog via Little Jenny Wrens blog. I think your challenge is fantastic, just wondering if I could actually manage it? Did you turn 41 on September 20? It was my birthday on September 20 and I turned 41. Could we be twins...LOL?? Just wanted to say thank you for throwing down the challenge, and making me feel guilty enough to go public and put my money where my mouth is! I have always modelled my life and house on that Country Living ideal with its seductive warm glow pics - at least it doesn't look shiny and new so it must be compatible with the secondhand life! and as for the puppy classes? Lovely lovely lovely! Is that the US version of CL, or UK? Little Olive cannot attend this week as she has moisturizer ingestion problems. e, that's just the most perfect excuse... genius!!! 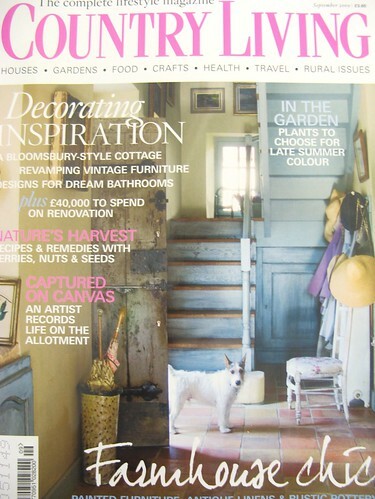 Country Living, British edition - I hold my breath each month for the new one to arrive here in our stores in Cape Town. I have bought every last one since I discovered them 5 years ago. I have not thrown one out, yet. What inspiration, what lovliness, what a pleasant afternoon, lazily paging through each and everypage - more than once! Oh Country Living Magazine, the goddess of all things paper! I have just discovered your blog and have spent the last age pouring over it. It's lovely and looks so beautiful. I adore it! I have joined the cause!! Should be interesting?!! I'm a born shopper...just a few habits to break! Well impressed with the 365 day challenge. We tend to buy most of our items from boots and charity shops (with the occasional ebay bargain thrown in). So I decided to make it official and give it a go.... You will have a lot to answer too if the New Looks, John Lewis's and Ikeas shares drop over the next 12 months!! Just imagine what it could do to the economy if all the bloggers took on the challenge! I have started working on some items and will post them on my blog Keep up the good work.